Thirty years ago I commissioned my first illustration. At the time I was playing in a Play-by-Mail game run by a company in Tasmania. It was a storytelling game. I asked their staff illustrator to draw the main characters encountered in the game, one character per turn. Game turns were monthly, so each turn I would receive the response to my character's machinations as a chapter in the tale and there would be an accompanying illustration. Each turn cost $10, including the illustration. The game itself died after about six months - but I still have the illustrations. Our Kickstarter gave us a budget of about US$2,500.oo for artwork for the game Blade of the Iron Throne. We had permission to use some existing artwork and we had a small amount of artwork from the Beta that was available for use in the new Pro version. With a layout of 300+ pages we wanted about twenty new illustrations. We wanted all of the illustrations completed inside two months. With about twenty illustrations on the cards I knew I needed four or five artists to do the work. Two artists, Matthew Cuenca and Grace Palmer, I had worked with before on other projects. They are professional artists, well able to hit a deadline with quality work. There are some gallery sites such as Elfwood and DeviantArt that I would like to say are very helpful in locating good commercial artsists. I would like to say that but I can't because they aren't. These days these sites are filled with dross and photographs. Those artists that are, by and large, good enough to do commercial work may have once had accounts on those sites but they have long since gone dormant. Having trawled DeviantArt for suitable artwork I attempted to contact six artists. Two responded -- one immediately (Alec Webb), one six weeks later. We ended up using Alec as one of our five artists. Richard Luschek I had also worked with before and his work will be familiar to anyone who uses Pathfinder or Harnmaster. His artwork is of the highest order. It had been many years since I had contacted Richard. So I Googled and found his fine art studio. I contacted Richard and was pleasantly surprised (OK, I was amazed) that his rates were still in our ballpark. So I happily slipped into his schedule wherever he could find a slot for us. Finally, Mike Perry contacted me once the Kickstarter completed and asked whether we might have need of his services. Mike is a well credentialled artist having worked on many productions inside and outside of the gaming industry. I jumped at the chance to work with Mike. It was Mike who created the image that is behind this article. Once you've found an artist whose work you like you can begin the process. First up, you need to establish email contact and find out whether they are interested in working with you. If they are, then you need to establish a price for the work you want done and determine a payment schedule (half upfront, half on completion or whatever else suits both parties). They may want a contract in place which covers who owns the copyright, the publishing rights, etc. You also need to know when they are available to do your work and when they think they will have it completed. With all of that out of the way you can start the process of detailing the illustration(s) required. My advice here is simple. If you haven't worked with the artist before, provide enough information to show you have a reasonable idea of what you are looking for but not so much information that the artist is limited by your photo-like description. Give the artist some creative space, but let the artist know what is important to you. Jaida is a tall Arabic woman wearing Byzantine armour (lamellar scales over maille hauberk) and brandishing a long-hafted axe that is used two-handed. Her conical helm is solid steel and covers above the eyes. She has a languid grace, fast and dexterous for her height. Her nose has been broken more than once. Rabi'ah is a minor Persian sorceress and gifted archer. Her knowledge of the lesser Mysteries allows her to commune with animals; the more intelligent the animal the deeper the bond. Her Arabian pony is her prized possession, a gift from a wealthy suitor. Petite and pretty she does her best to remain out of sight and out of mind. She is dressed in a soft cotton shirt over which is a sturdy leather vest, and with sturdy leather pants designed for riding and boots. She carries a bow designed to be fired from horseback. Jaida and Rabi'ah are at a small oasis. They have paid the necessary coin to have their horses watered. They have a map between them, Jaida holding one end while Rabi'ah holds the opposite end. Jaida is pointing towards a rocky outcropping in the distance while Rabi'ah is pointing to something specific on the map. Rabi'ah is in arcane conflict with a male sorceror. He stands beside an altar on which is tied a man in his thirties, the victim is stripped to the waist. In front of him some shaggy beast has collapsed, an arrow through its throat. The male sorceror is making a slashing gesture with his hand towards Rabi'ah, his fingers curled into talons. Rabi'ah carries her bow in her left hand. The bowstring has been cut and the string flutters from either end of the bow. We can also see that Rabi'ah's vest has been slashed, her left upper arm is bleeding from talon marks but the vest saved her from a far worse wound. Rabi'ah is making a defensive gesture with her right hand. Between the sorcerer and Rabi'ah we can see an arcane shield block the taloned strike of a massive arcane beast (we see an arcane paw but not the rest of its body). 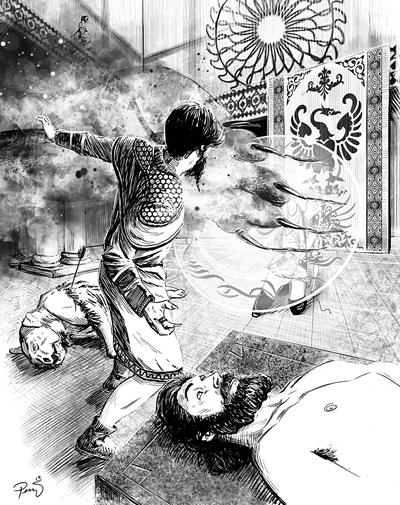 Meanwhile Jaida is hunched on a ledge above the sorceror, preparing to leap down upon him, axe swinging. Jaida and Rabi'ah have won the conflict. The sorceror is dead, two more of the shaggy beasts are dead beside him. The male victim is sitting on the altar with the ropes that were holding him cut, legs over the side, wiping his brow in relief. Beside him on the altar the women have placed a small treasure chest. Its contents have been upended onto the altar. Jaida has taken a ring from the chest and is placing it on the index finger of Rabi'ah's right hand. A gem on the ring glows with an unnatural light as the magical ring seems to sense her attunement to the Mysteries. They are smiling at each other, victorious. Now, a word on sketches. 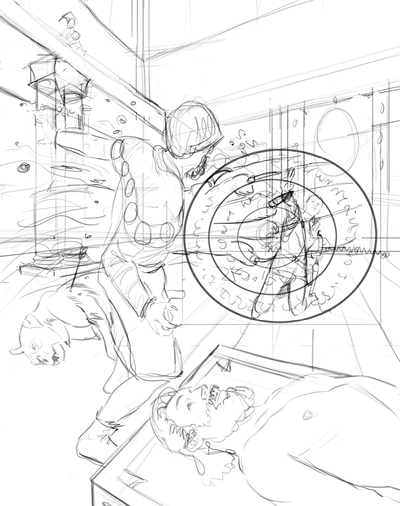 The initial sketch gives you an idea of scene composition. Before the artist commits too much time to the illustration they need some confidence that where they intend heading is where you want them to go. Now is the time for you to make your thoughts known. If you don't like any of them, say so -- don't just pick the one you hate the least. If there isn't enough detail in the sketch for you to see where it is going, ask the artist what he intends. Make sure you have enough information to make a sound decision -- and then stick with that decision. Now you can see slearly how Mike has interpreted our description. We can see that Jaida is still some distance from the sorceror on the ledge -- but the Point of View dictates that this was the only way to have her in shot. Rabi'ah is behind her arcane shield - which will make it difficult to see any detail on her in the final image. That said, we now have far more detail of the sorcerer and the arcane beast that strikes at Rabi'ah.